Our oldest daughter returned to her post-doctoral position in the Pacific Northwest yesterday, officially ending the holidays in the Wilkins household (our other daughter and her husband went back to New England a few days earlier for her to resume her medical residency and him to start graduate school studies). Our son will return to college in the next week or so, and empty nest syndrome will once again set in here. Poor Izzie misses the kids almost as much as my husband and I do! 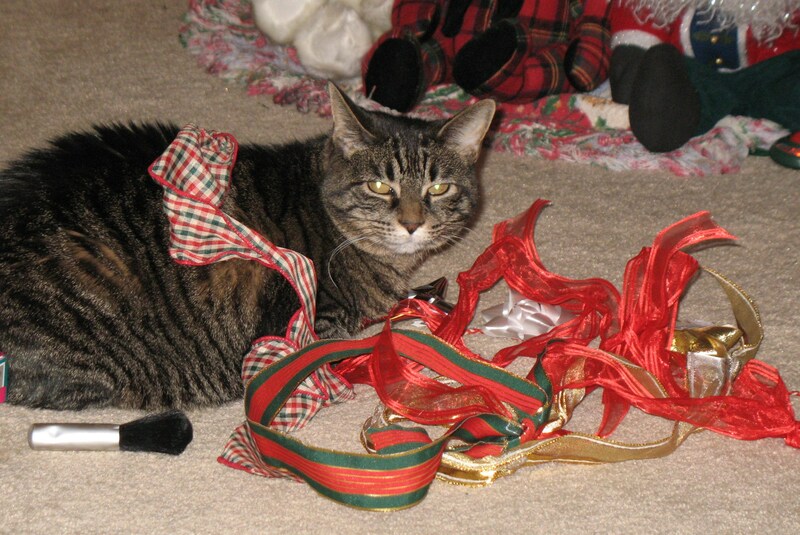 She’s pictured above sitting among bits of discarded ribbon on Christmas day (she managed to get the one on her back all by herself, as if she wanted to be dressed in Christmas finery, too!). See the makeup brush in the photo? That’s her favorite toy. She stole one of my makeup brushes soon after moving in with us almost eleven years ago and the brush is rarely out of her sight. This is actually her second brush — the first one finally disintegrated, but she seemed happy enough with the substitute. Silly cat. It was an interesting holiday season. Much of central Arkansas was flooded on Christmas Eve, making it an adventure and a challenge for us to pick up our daughter and her husband at the airport that afternoon and then make it to my mother-in-law’s house and candlelight service that evening. We swapped gifts, ate many good meals, played lots of games — Settlers of Catan was the new game this season, one my daughter and her hubby discovered during the past year. I really enjoyed it — as well as the Yahtzee, Uno, Phase 10 and Apples to Apples we also played (I get stomped a lot! but I enjoy playing, anyway). We watched football and saw two movies — Sherlock Holmes (fun) and Avatar (3D Imax — cool!). We spent a cold day in Hot Springs National Park, strolling down historic Bath House Row, warming our fingers in the steamy hot springs, and admiring the wooded trails of Christmas lights displays through a 210-acre botanical garden, Garvan Gardens. We toasted in the New Year and ate our customary, lucky New Year’s Day meal of pork and black-eyed peas. We even had a little snow this week — less than a half inch that melted by noon, but was still enough to close down the local schools, Arkansas being woefully unequipped for snowy roads. I hated seeing the holidays end and having my girls return to their separate coasts, but I enjoyed every moment of having them here and will treasure the memories, as always. And now it’s back to my real life. And goodness, I’m so far behind! I’ve posted details of the new contest on the Enter to Win! page. Don’t forget to submit your name for the drawing. I’m now working on the fourth book in the Doctors in Training series for Silhouette Special Edition. Book 2, PRIVATE PARTNERS, will be available in February, so keep an eye out for it! If you missed book one, DIAGNOSIS: DADDY, don’t worry — the books stand alone. You can still order that first book from eHarlequin.com or I have a few extras (check details on my backlist page). I’m having a great time with this series! I hope you’re enjoying them, too. So, it’s back to catching up for me now. I want to wish you all a very happy, healthy and creative 2010!